Wrapping up the weekend.Luncheon went over nicely. Lots of swimming, lots of talk about manuscripts becoming Lulu books. Lots of interest there. The Cornell Chicken was great...new approach versus the hot hot grill...low heat, slower time...better, much better results. Every bit was devoured. I guess that would be qualified as success. Trying to get all the bits and pieces together to migrate to Tburg for the next few days as commuting and the first day of school doesnt make sense. But, next week it might! We bobbed in the waves yesterday after 6 p.m. and had a nice time...it was brisk but does wonders for the sleeping. The spa effect erased our brains...which is one of the many reasons we love Sheldrake. --hassle Syracuse for the transcript. Called before. No results. Called our contact in the deans office..."its all "over there'". Now is the time to be the electric drill. I plan on calling daily for the next few days...and then crank it up to twice daily (with a contact name etc to make the pain more delightful). --visit with my former employee, KD and her husband Dan here from Oregon. --think about the Alchemy show and the Ancient Glass showbrands. This might be hopes for the week! We saw the Harvard Flowers exhibition at the Corning Museum of Glass on Sunday evening. It was wonderful. I had totally missed a very interesting point. 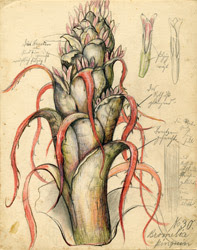 Not only were plants entirely rendered in glass (to size) but, the Blaskas then exploded the view and took details or parts and rendered them at wellover 1000% of the original size. So, this small bud on a branch was expoded to show the same bud huge (as big as two fists put together)--but with a bumblebee within the cut-away--showing how the pollen is released onto the bee. To tell the bee story, the cut away flower was rendered four times with the bee's position and shape changing within the context of the flower. My absolute favorite big and small plant was a moldy pear and leaf...absolutely frighening...with the exploded view being this wigged out , "under the microscope" rendering of the mold magnified to being essentially a 12"x 12"x 12" view of the spores up close. It was striking. Memorable. The museum did a nice job of telling the people story of the father son team (Blaskas), and the individuals at Harvard who were instrumental to this singular collection being established, funded and collected. It is a shame that Harvard does not fully understand the import of this collection and focus on maintaining, conserving and showing this teaching tool to it's best. It transcends the Natural History vibe and goes to the world of art and materials. If you have a chance...please visit the show. It is memorable and might change the way you think about plants. 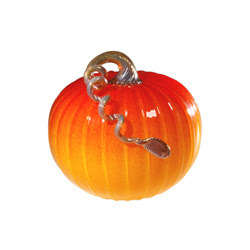 Kitty and I picked out several glass pumpkins for our dining room table and a few others. I have a friend and a second cousin who are going to be proud recipients. We had fun trolling the Corning Museum GlassMarket which truly is a treasure trove of things worth bringing home. We held tight to our wallets...buying only a small pumpkin patch!